There was a time when Clocky defined the evolving genre of smart alarm clocks. As the alarm clock on wheels that jumps off your nightstand and runs away beeping if you tap the snooze button, Clocky remains an innovative solution to waking up on time. But that was years ahead of the debut of the first Amazon Echo voice-activated speaker and the cloud-based Alexa digital assistant, a hands-free world where there are no buttons, merely voice commands between man and machine. So it was, ahem, just a matter of time before an Alexa-powered device was primed for its bedroom debut. 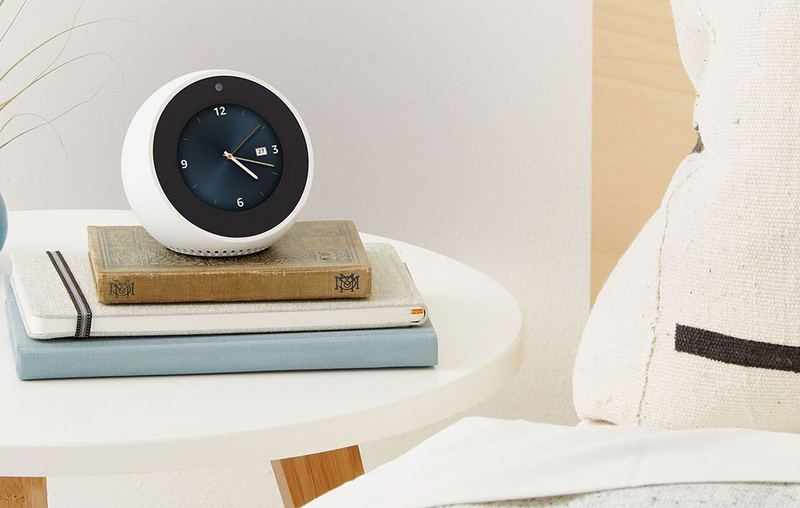 Enter the Amazon Echo Spot, an über-smart clock modeled in the shape of a dual bisected sphere and graced with a circular 2.5-in. touchscreen. Amazon makes alarm clock usage appealing with the Echo Spot, providing various clock faces and enabling the device to wake humans to music, weather, visual flash briefings, and more—set by simple Alexa voice commands. Image: Amazon. The $130 Echo Spot does everything previous Amazon Echo devices do, including processing a vast universe of spoken Alexa commands, functioning as a speaker, streaming music services over Wi-Fi, handling audio phone calls, and controlling smart-home devices. Then—largely attributable to its circular screen and front-facing camera—many more features come online, including the ability to play videos from Amazon Video, stream video flash briefings from media outlets, viewing lyrics from Amazon Music songs, displaying weather conditions, conducting hands-free video calls with friends and family who have the Echo Spot, Echo Show, or the Alexa app on Apple iOS and Android, and more. Amazon is careful not to merely categorize Echo Spot as a smart alarm clock, and in fact makes a solid case that the device is suitable for use in any room of the house. But that 2.5-in. screen is best observed at short viewing distances, such as from a bedside or kitchen countertop. However, Amazon makes alarm clock usage quite appealing by providing various clock faces, and moreover, through designing the device to wake humans to songs from Amazon Music, delivery of visual flash briefings, and the ability to simply tap the touchscreen to instruct it to stop. And setting those wake-up alarms or kitchen timers could not be easier, accomplished with short and simple Alexa voice commands. The Echo Spot delivers hands-free, picture-in-picture video calls with friends and family who have the Echo Spot, Echo Show, or the Alexa app on Apple iOS and Android. Image: Amazon. True to Amazon Echo and Alexa form, you can expect even more skills and capabilities to come online in the Echo Spot over time. There is a gift-giving caveat with the Echo Spot, however: Amazon says they will not begin shipping until after the holidays.